added to our aloe vera gel—no water, preservatives, colors, thickeners, nor flavors. Aloe 1 the inner leaf is hand filleted in the field, run through a grinder much like kitchen disposal, immediately run through a 50' stainless steel pipe cooled to 50 degrees and put into containers for shipment and immediately frozen. NO other processing is done to this product. The product is shipped FROZEN - triple packed with dry ice. Aloe 1 is virtually Aloin free - a remarkably 2 to 4 parts per million - what this means is that Aloe 1 does not cause a laxative effect. Aloe Vera Gel – contains little or no aloin – made from the inner leaf filet. The outer green parts have been cut away. Aloe Vera Juice – contains aloin – made from whole leaf aloe vera. Essentially, the whole leaves are put in a blender and processed into a beverage. 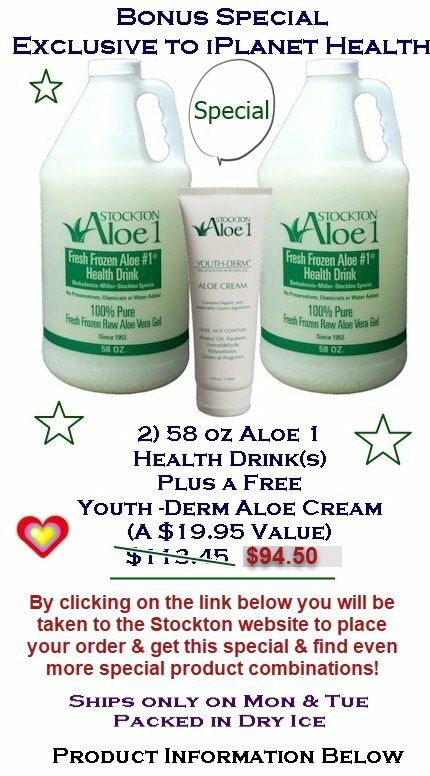 Stockton Aloe 1 uses inner gel from the filet only in their 100% pure aloe vera gel beverage. Prior to grinding, the filets are rinsed to minimize the possibility of aloin content. So do we remove the aloin? No we do not, but rather, we prevent the aloin from getting into our aloe. Some companies rely on using processing agents including diatomaceous earth and activated carbon to clean the aloe of the excess aloin. This is not a problem that we have to contend with. It is shipped ONLY on Mondays and Tuesday via UPS 3rd Day Service. You ONLY pay for UPS Ground Service - Stockton Aloe 1 pays the additional fee to ship it via 3rd Day Service!! We ship to all parts of the continental U.S. even in Summer!